Sotheby's And Bonhams Bow To Pressure, Ban The Sale Of Rhino Horn Artifacts Both companies announced they are canceling separate auctions featuring antique carvings made of the endangered species' horns. The sales would have taken place in Hong Kong this week. Rhino horns are prized in Asian countries and can garner tens of thousands of dollars per pound. Wildlife conservationists argue that the appetite for the endangered species' appendage in legal and illegal markets has decimated the population across Africa. Over the last week two renowned international auction houses have canceled upcoming sales of rhino horn artifacts, capitulating to mounting pressure and criticism from wildlife conservation groups who argue the legal sale of parts of endangered species promotes illegal poaching and rampant slaughter. Bonhams, a London-based auction house, announced on Friday that it would remove 21 lots of antique rhino horn items from a sale that was set to begin on Tuesday. Agence France Presse reported Humane Society International put the estimated value of the carvings at $3.87 million. Matthew Girling, Global CEO of Bonhams, insisted the auction house only sells rhinoceros carvings with a known provenance and licensed by the Convention on International Trade in Endangered Species. "We do, however, recognise there are widely held concerns about this issue and have decided that the sale of the rhinoceros carvings scheduled to take place in Hong Kong on 27 November will now not take place," Girling said in an emailed statement to NPR. "In future, Bonhams will not offer artefacts made entirely or partly from rhinoceros horn in its salerooms," he added. In recent years, the markets for, and uses of, rhino horn, which is valued for its purported medicinal qualities throughout a number of Asian countries, trading on the black market for tens of thousands of dollars per pound. An estimated 2,100 rhino horns were illegally exported from Africa to China and Vietnam in 2015, National Geographic reported. On Saturday, Sotheby's representatives echoed similar sentiments, saying three lots of rhinoceros horn antiques had been withdrawn from a different sale scheduled in Hong Kong later this week. "The company will no longer offer rhino horn artefacts in the future," Nicolas Chow, chairman of Sotheby's Asia confirmed in a statement to AFP. "Sotheby's deplores any illegal slaughter and trading of endangered wildlife, and strongly supports conservation efforts from the global community," he added. Christie's said in October that it "does not sell any items which include rhino horn, nor do we accept hunting trophies from endangered species." The reversals by Bonhams and Sotheby's followed increasing pressure from 37 wildlife conservation organizations, including WildAid, to permanently stop selling rhino horns. "By continuing to sell rhino horn carvings, whether genuine antiques or not, Bonhams is contributing to the demand for rhino horn in East Asia and, therefore, to the mass slaughter of rhinos," WildAid CEO Peter Knights said in a letter to the prestigious auction house. WildAid has also circulated an online petition alleging that a Chinese expert had determined "many of the rhino horns up for sale are not genuine antiques but are in fact horns from recently poached rhinos carved in an antique style." As of Monday afternoon, the petition had gathered nearly 11,000 signatures. "We congratulate Bonhams on its wise decision to stop selling rhino horn items. The rhino will only survive if the trade in their horns, in whatever form, is stopped," John Baker, managing director of WildAid, said shortly after the company's announcement. As NPR reported, South Africa — home to roughly 80 percent of the world's rhino population — has seen poaching explode over the past decade. "In 2007, 13 rhinos were killed by poachers. Last year, that number was 1,028 — down from a peak of 1,215 three years earlier, according to TRAFFIC, a monitoring network for wildlife trade. 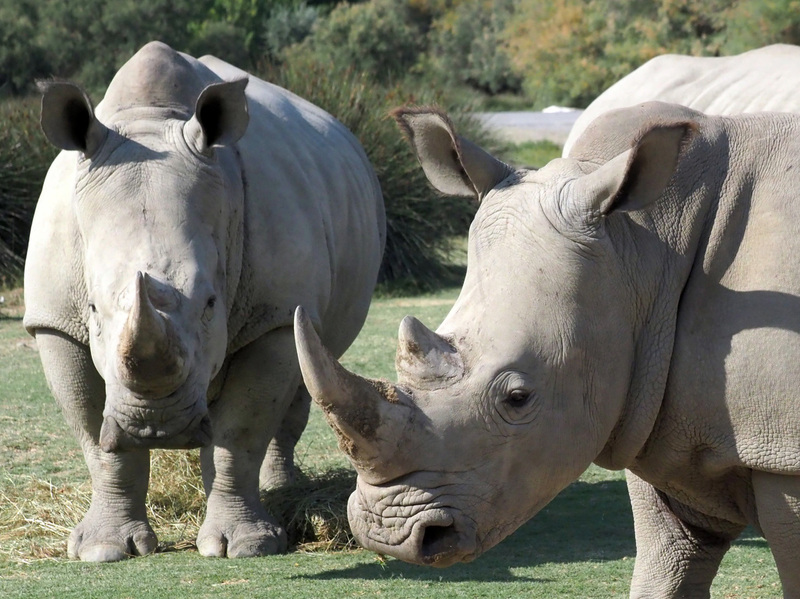 African rhinos include the near-threatened white rhino and critically endangered black rhino species." China banned the use of rhino horns in traditional medicine in 1993 but in October, the State Council issued new regulations lifting the prohibition, as well as those on tiger bones. The move opened up exceptions for medical research and for the benefit of cultural exchange. The shift in policy was met with outrage from conservation groups and two weeks later authorities declared the ban on "the import and export of rhinos, tigers and their by-products" would remain in place, the South China Morning Post reported. "In 2017, South Africa hosted its first online auction of rhino horn, following the lifting of the ban on domestic trade. The auction attracted fewer bidders than anticipated," AFP said.